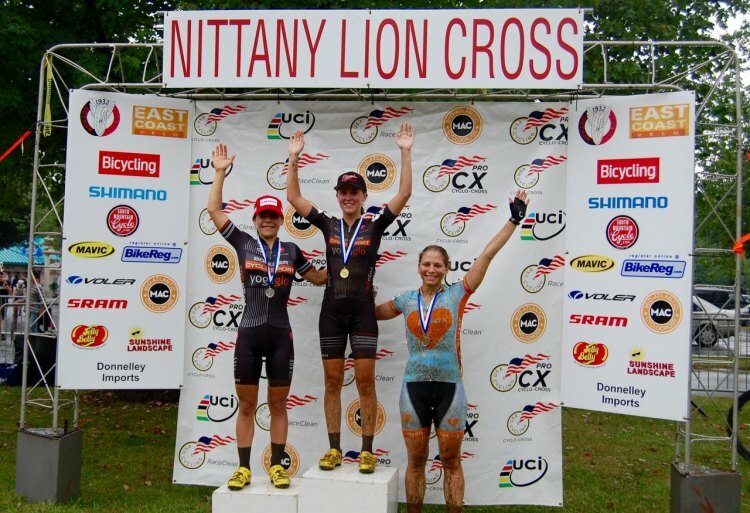 The early bird did not catch the worm on Day 1 of Nittany Lion Cross. The elite women took to the start grid in a light drizzle, which progressed to steady rain by mid-race for the first wet race at this venue since 2011. After a very fast start, a crash in the first sharp turn forced two past race winners into chase mode. Arley Kemmerer (Level Eleven Racing) moved from the back of the pack up to an eventual 9th place, while Gabby Durrin (Neon Velo) suffered a race-ending mechanical. Meanwhile, the bottleneck created an opportunity for Amanda Miller (Boulder Cycle Sport / YogaGlo) and Ellen Noble (JAM Fund/NCC/Vittoria) to slip away, with Miller's teammate Crystal Anthony close behind. Noble stretched the elastic in the flat power sections, while Miller. Several laps later, Noble bobbled a dismount before the run-up and Anthony closed the gap, quickly attacking to move into 2nd position. 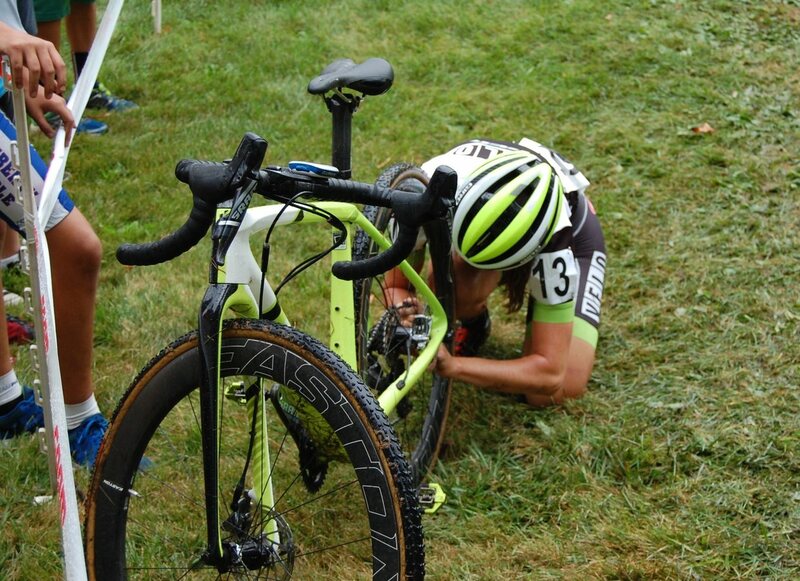 "The key to today was just to stay smooth," said Miller, who seemed to float easily through the greasy, off-camber U-turn that became today's signature course feature. 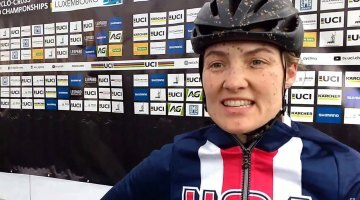 Best known for her professional road career, Miller drew on collegiate mountain bike experience and said she was comfortable in the mud. "It was very comforting to know I had a teammate behind me. We're pretty happy with stacking the podium." 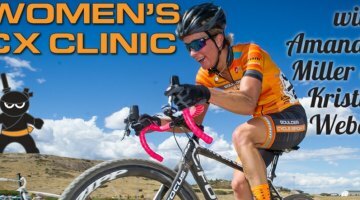 Behind the Boulder duo, Rebecca Fahringer (Amy D. Foundation) rode a strong and consistent race to move into third position, where she would stay for the remainder of the race. "There were a lot of great straightaways in back where I could just lay down some power," she said. "Then with two to go I was almost walking the turns. I thought, 'as long as I stay on my bike, this will go well.'" No doubt the support of Fahringer's new team eased the way. "We're run in parallel to the Raleigh-Clement team. They're so organized, they're so supportive. Dan Dombroski is a really great asset." With the first three places established, the closing laps were animated by the battle for fourth between Ellen Noble (JAM Fund) and Ally Stacher (Stan's NoTubes). The duo traded positions until the last lap, with Noble taking a slight advantage in the back half of the course to finish 4th. In what commentator and legendary bike racer Laura Van Gilder called a "breakout ride of the day," Jena Greaser (JAM Fund/NCC/Vittoria) took sixth. 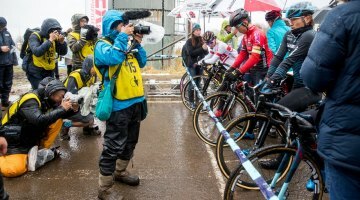 Dan Timmerman (Stan's NoTubes Elite) took the early lead in the Elite Men's race on Day 1 of Nittany, as rain dwindled to sprinkles but the course stayed slippery. His chaser was the young Belgian Wietse Bosmans (BKCP-Corendon), ranked #1 in the world after double UCI C1 victories in China. Meanwhile, a group of Jeremy Durrin (Neon Velo), Kerry Werner (Raleigh-Clement), Cameron Dodge (Unattached) and Curtis White (Cannonade p/b Cyclocrossworld.com) were close behind. Taking turns, the four chasers put over 30 seconds into the rest of the 70-rider field. With four laps to go, lead and chase groups were firmly established but the stakes in each were still high. Timmerman and Bosmans traded the lead, choosing wildly different lines through the greasy, off-camber u-turn. Timmerman aimed high and inside, which put him through the section first, while the outside line preferred by Bosmans carried more speed. Dodge seemed to be testing his leash from the chase group, slipping off the front now and again. With one lap to go, he put in a final punch to secure third place. "They [Bosmans and Timmerman] basically had 10 seconds the whole race," Dodge recalled. "The four of us worked together. Jeremy fell in the turn after the pit and then it was Curtis, me, and Kerry. The turn after the start/finish is where I went." As for tomorrow? "Well, a podium would be nice again," Dodge concludes. Curtis White and Kerry Werner came to the line in quick succession, followed by Durrin for 6th. 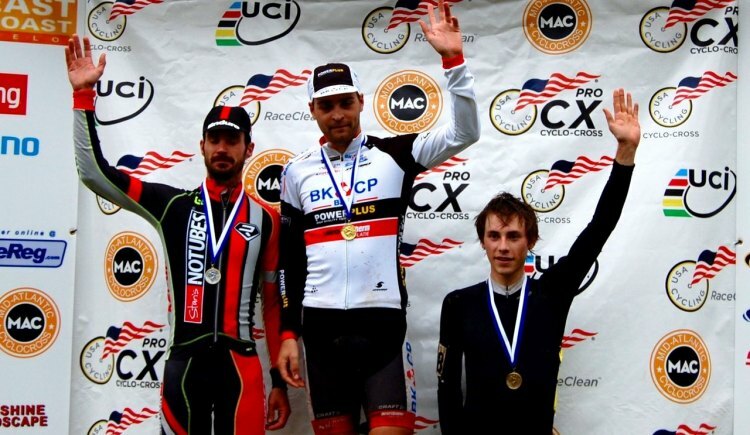 Anthony Clark (Squid Bikes/Voler), Ben Berden (WCup-Stomper), Nick Waite (Pro Tested Team), and Dan Chabanov (House Industries/Withings/SimpleHuman) rounded out the top 10. Last year's dark horse Day 1 winner Jacob Lasley (Soundpony) was again in attendance, taking 16th place with a smile. The action continues tomorrow in Trexlertown, Pennsylvania with Day 2 of Nittany Lion Cross. You can find photos and top ten results using the slider below. Rider interviews coming soon. 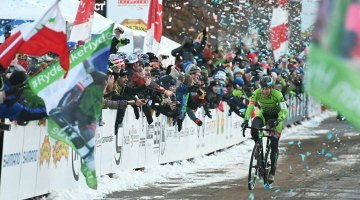 Wednesday Wonderings: What’s Changed on the UCI Cyclocross Calendar? Would someone please sponsor Cameron Dodge already! He’s been in the podium every race this season. Pretty sure he is just waiting for the right sponsor and that offers exist.